(Scott Sommerdorf | The Salt Lake Tribune) Some who came to the Count My Vote public hearing at the Whitmore Library in Cottonwood Heights brought signs voicing their displeasure with the Count My Vote ballot initiative seeking to select party nominees through a direct primary, in addition to the traditional caucus-convention system, Friday, Oct. 27, 2017. A man and woman working for a Utah-based company to collect signatures for statewide ballot initiatives have been charged with forging names on the documents. A Weber County election clerk discovered the apparent forgeries when comparing signatures on petitions for the Utah Medical Cannabis and Count My Vote ballot initiatives to the voter roll, according to documents filed Tuesday in 2nd District Court. The two, who worked for Gather, later admitted they’d forged the names, according to court documents. The clerks found a combined 472 forged signatures in 16 packets the pair turned in. The two were paid almost $2,100 for the signatures. Prosecutors charged the workers with multiple counts of forgery, a third-degree felony, and misconduct of elector and officers, a class A misdemeanor. Hatch said election clerks caught the apparent forgeries early in the process. The forgeries appear to have only affected two of the six statewide initiatives, according to the release. As of Feb. 13, the medical marijuana petition had garnered over 140,000 signatures. To qualify for the November election, 113,000 of those must be certified as valid. 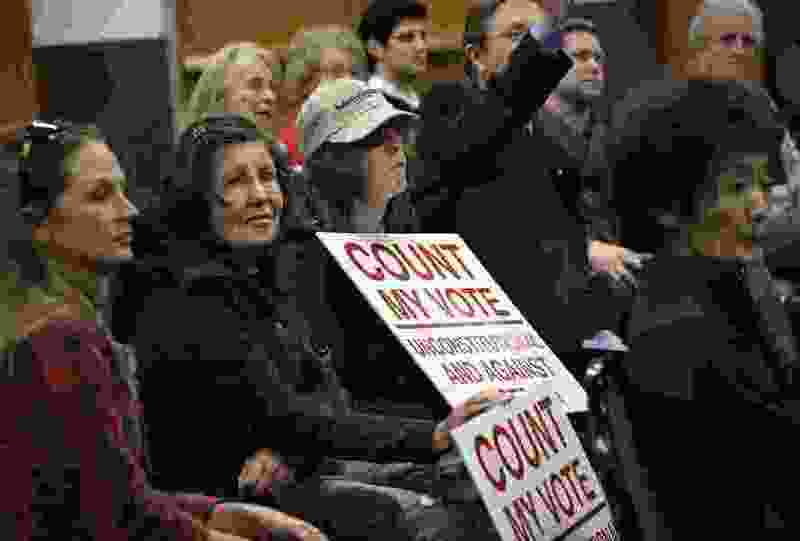 Count My Vote, a group in support of the Direct Primary Election Act, has collected 100,000 valid signatures as of Wednesday, executive director Taylor Morgan said. This isn’t the first time a Gather worker has been accused of forging signatures. A Davis County man was charged Feb. 13 with three counts of misconduct of electors and officers after a county clerk found discrepancies in the packets the man turned in, including a signature from an individual who had died, according to court documents. The man, who was paid about $1.22 per signature, told police he’d forged all the names on three packets he turned in. Gather’s founder, Tanner Leatham, said Thursday that the company has cooperated in all three investigations. “We have several things in place to help prevent it, but unfortunately if someone wants to cheat, or lie, or be dishonest, there’s always a way for them to do that with our current system,” Leatham said. Signature collectors, who are independent contractors, attend a week-long training before they start work and must sign a contract that tells them the consequences of making up signatures, he said. They are paid per valid signature. Leatham added that forgeries and fraud are inherent in the state’s current method of gathering signatures, and the only way to prevent them is by moving to an electronic system. “It is 2018, and we shouldn’t be using paper and pens anymore to do stuff like this. It’s a lot more secure when you use a software that records locations, and it records other information that only the voters know,” Leatham said. Despite the three recent cases, Leatham said his company has a good reputation for collecting valid signatures. That’s in part, he said, because they spend thousands of dollars on software that shows where a voter lives and keeps track of where a signature gatherer went with petitions. About 820 people have contracted with Gather during this recent signature gathering cycle, Leatham said.